Nobel Square pays tribute to South Africa`s four Nobel Peace Prize Laureates: the late Nkosi Albert Luthuli, Archbishop Emeritus Desmond Tutu, former State President FW de Klerk and former President Nelson Mandela. 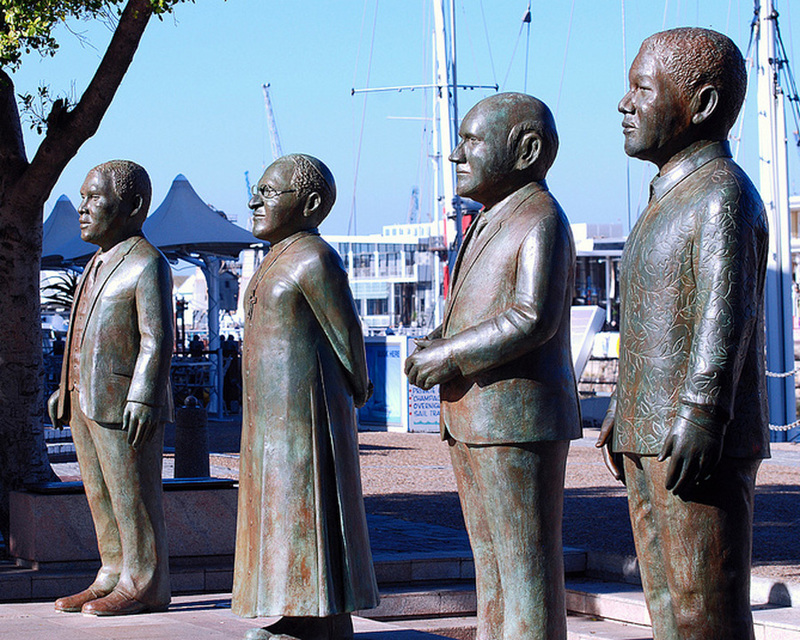 The larger-than-life bronze sculptures of the four Laureates were created by internationally acclaimed artist Claudette Schreuders, and they reflect the ambiquities of the search for an ‘African’ indentity in the post-apartheid South Africa. The fifth sculpture in the square, Peace and Democracy, created by Noria Mabasa, acknowledges the contribution of women and children to the attainment of peace in South Africa. Join us in honouring these great men, at this place of reflection. Enjoy a range of talented musical performances from the V&A Waterfront Buskers programme. We encourage you to take a moment to stop, listen and support these incredible musicians on the night.